Since the publication of Insider Secrets of Public Speaking, we have been delighted and flattered to receive invitations to speak at all kinds of events on the subject. Distilling the core themes of the book into a session that is useful and interactive has meant dipping back in and taking our own advice. 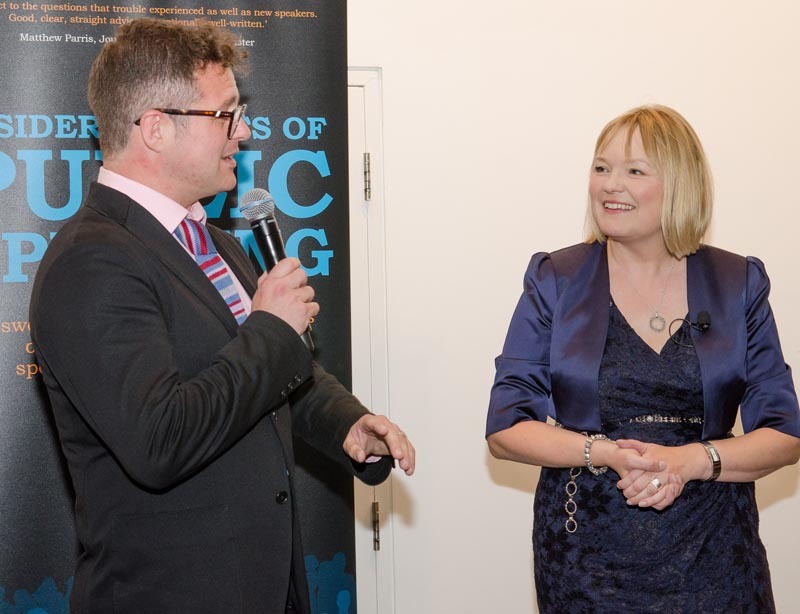 Last week, Ian Hawkins and I spoke at a Communications event for UK Registrars Group at the Museum of London. Our workshop, Three Golden Rules of Public Speaking, received the feedback that it was ‘fun, engaging and memorable’ – which is precisely what we were aiming for, aided and abetted as we were by three brave volunteers who we invited onstage to share their experiences. One of the reasons that people are nervous about appearing onstage is that taking the limelight is a big responsibility. We often use the analogy of driving a car to describe public speaking: when you start out it feels like there is a lot to learn, and the best speakers have, like experienced drivers, good habits that they almost don’t think about. Sticking with this analogy, the audience are like passengers: if they feel the driver is not in full control, or inexperienced (or worst of all, drunk), they are not going to have a relaxing journey. What helps with your nerves as a speaker (and for the audience’s peace of mind) is to pay attention to the little details that make you look in control. When the speaker strides onstage, arm extended towards the host, shakes hands and stands confidently in the centre facing the audience, you know they are in charge. When the speaker struggles on, drops their notes, forgets to shake hands and fumbles with their glasses, you know the next few minutes are more likely to be chore than charm. How you walk on can make a big difference. When the person who is handing over to you asks (and they should) how you would like to be introduced, ‘as briefly as possible,’ tends to be the right answer. What if you’re the first person to speak? We’ve always liked the introduction that we first heard from Ben Elton (though he can’t have been the first to use it) which was very simply: ‘Ladies and gentlemen will you please welcome me – Ben Elton.’ Delivered from the off stage mic, the response gives you a pretty good indication on what the audience is going to be like before you start proper. If your style isn’t quite as blustery, you can just walk in and give a friendly but business-like ‘Good morning… and welcome to…’ which gives people enough time to stop talking to each other and give you their focus. The main thing is to do whatever you’re comfortable with, do it with conviction, and make all your messages positive. ‘Well done on braving the snow and ice,’ is better than ‘sorry about the weather’ (over which you have no control) and look like you’re pleased to be there, or else the audience will soon wish they weren’t. If there has been a change of plan, focus on the achievement of people pulling out the stops, don’t harp on about the brilliance of the speaker who couldn’t make it (while the hero who has stepped in at the last minute is listening in and thinking ‘hello?’). What might seem little things create expectations for the audience, and expectations can begin before the audience has even sat down. You want audiences to have positive rather than negative expectations. We recently met a comedian putting together a new open mic night at his local university. The poster announced ‘amateur comedians’. Could, we gently asked, the word be changed from ‘amateur’ to ‘up and coming’? There is nothing wrong with amateurism, but in a performance setting, it is a word loaded with connotations. Whatever the circumstances, once you’re on, you make the space your own. Move things to one side if they are in your way and they are easy to put back again (we once saw Joan Rivers at a corporate awards ceremony uproot a small shrub from an on-stage display and hand it to Manager of the Year in lieu of a trophy). Rise above bad circumstances: if you don’t mention them, they become backdrop. If you draw attention to them, you’re signalling that they are in charge not you. The same goes for your mistakes: if you make mistakes, be in charge, own them and learn from them. Green Party Leader Natalie Bennett’s infamous interview on LBC made headlines for being a truly abysmal broadcast performance. In our public speaking/car driving analogy, this was a 60-vehicle pileup across three lanes of motorway. The response? Ownership. And MP Caroline Lucas delivered a faultless bookend to the whole affair: ‘I’d far rather be talking about this than having to defend Jack Straw or Sir Malcolm Rifkind [both accused of impropriety this week]’ she said, which quickly became the default response. The take away lesson is clear: losing control of your mouth is a setback but not a career-ending disaster – IF you put it in proportion, avoid apologies and (most importantly) learn your lesson.